Procession of Civil War veterans marching north on South Pleasant Street. They are preceded by a band and marshall and followed by a group of women or children and a group of carriages pulled by horses. This is probably a Memorial Day event which followed a similar program for many years: speeches in the schools, speeches at various locations in area towns where the local Civil War veterans gathered en masse, a luncheon, and finally, a gathering of the veterans on the Amherst Common followed by a procession to the West Cemetery where there were more exercises. This photograph may have been taken in 1911, the 50-year anniversary of the start of the Civil War. 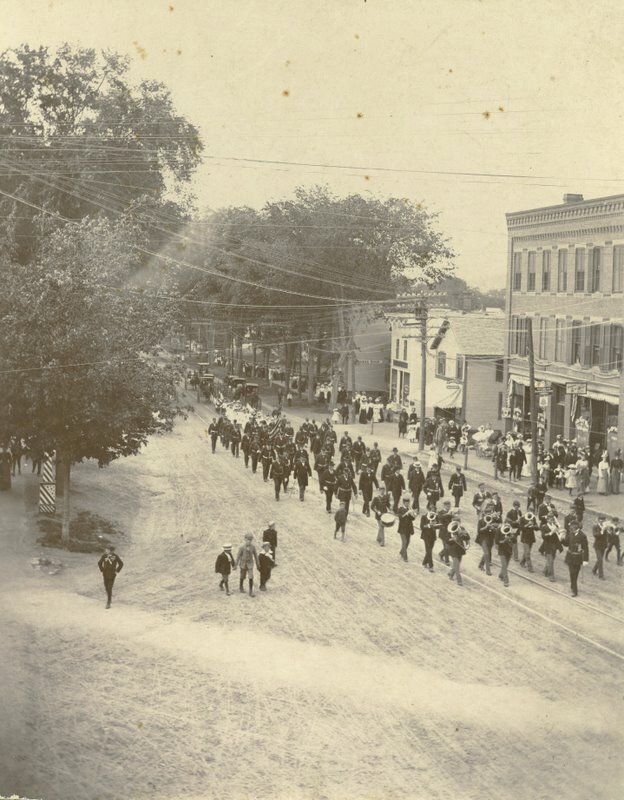 Kenfield, Charles R., “Procession of Civil War veterans,” Digital Amherst, accessed April 22, 2019, http://digitalamherst.org/items/show/782.